The great continent on which much of the Silmarillion, and the adventures of The Hobbit and The Lord of the Rings, are set. Little is known of the east or south of Middle-earth, or of the far north, but the geography and history of its Western lands are chronicled in great detail. The foundations of Middle-earth were laid by Aulë in times ancient beyond reckoning, and the Valar lit the new lands with two great Lamps, Illuin in the north and Ormal in the south. From fear of Tulkas, Melkor had fled beyond the Walls of the World, and Middle-earth was a place of peace and beauty. 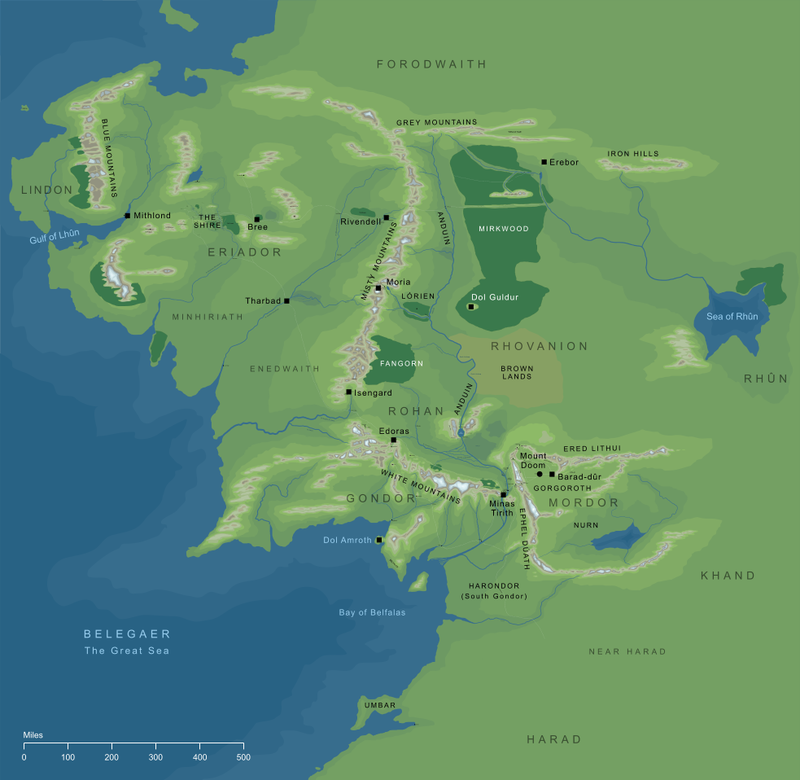 The Valar themselves dwelt in its central regions, on the green island of Almaren. This was the time known as the Spring of Arda. Unknown to the Valar, though, Melkor secretly returned, and delved his first great fortress of Utumno in the mountains of the far distant north. When he judged the time was right, he assailed Almaren and, surprising the Valar, destroyed their habitation in Middle-earth. Fleeing back to Utumno, he saved himself from the wrath of Tulkas. This is one of the great disasters of Middle-earth's history: the Valar departed forever, and left Middle-earth under the sole control of Melkor, who claimed it as his own. Though the Valar made a new home for themselves in Aman, and lit their new land of Valinor with the light of the Two Trees, Middle-earth was now left in darkness for many Ages. The Valar did not completely forget their ancient home, though, and Yavanna and Oromë, especially, came there from time to time to try and mend the hurts of Melkor if they could. It was at this time, too, that Aulë returned, and secretly fashioned a hall beneath the mountains of Middle-earth4. It was there that he wrought the Seven Fathers of the Dwarves, who were given life by Ilúvatar, but set to sleep until the awakening of the Firstborn. Despite these brief visits from the Valar, though, Middle-earth was effectively controlled by Melkor, who was free to act as he would. Slowly, his polluted realm spread southwards over Middle-earth. The Awakening of the Elves at Cuiviénen brought about profound changes in Middle-earth. At first they lived in darkness, prey to the creatures of Melkor, but Oromë found them, and the Valar decided to act: they went to war against Melkor. There followed the Battle of the Powers in the north and west of Middle-earth. That war rent and twisted the lands, giving them the shape they were to keep until the War of Wrath at the end of the First Age. Dorthonion and the highlands north of Beleriand were raised up at that time, and many bays, including the Bay of Balar, were created. Melkor was ultimately defeated, and taken as a prisoner back to Valinor. After much debate, the Valar also offered the Elves a home in Aman, and many accepted. Led by Oromë, the Vanyar, Noldor and Teleri made the Great Journey westward across Middle-earth from the far east where they had awakened. Many of these departed Middle-earth across the Sea, but some remained, of which the major groups were the Sindar of Beleriand and the Nandor of the Anduin valley. Other groups, mainly of Telerin origin, had also left the Journey: these were the people who were to become known as the Silvan Elves. Also, in the far east, remained the Elves who had refused the summons of the Valar, the Avari. All these kinds together are known as the Moriquendi, the Dark Elves, for they did not go to Valinor or see the light of the Two Trees. Where and when was Middle-earth? These comments (and many others, as we'll see) make it clear that Middle-earth is actually no more or less than our own Earth, and the story belongs to a time that was certainly long ago, but not unimaginably remote in time. In other words, the Shire and the lands around lay in the same region of the world as modern Europe. As the characters travel south from the northerly latitudes of the Shire, the climate becomes warmer and drier, just as it would for a traveller journeying from (say) Britain to the southern parts of Europe. Beyond the lands visited by the Hobbits are others, less familiar, to the south and east. It doesn't take much imagination to identify the mysterious eastern lands of Rhûn with part of Asia, or the hot southern lands of Harad as being part of Africa. The new lands to the west must surely be the Americas. Those in the east are less easy to identify - perhaps these words refer to the emergence of, say, Australia or Japan, though it's much harder to be sure of Tolkien's intentions in this area. This is less definitive than it might appear, because other references hint at slightly longer time-scales, up to about 8,000 years. So, we can't say exactly how long ago Frodo made his journey into Mordor, but it's clearly somewhere between about 6,000 and 8,000 years ago. The dating of Tolkien's world places it just on the fringes of our own prehistory. Historically, 6,000 to 8,000 years ago most of the world was still in the Stone Age, and the shapes of the continents and their shorelines were basically in their modern form - quite different from those shown in Tolkien's maps. So, what happened? Such drastic change seems to imply that some great catastrophe overtook the civilizations of Middle-earth before our own era began, but if that was Tolkien's intention, he does no more than hint at the possibility. By our time the fading of the last Elves east of the Sea is all but complete, but a few still remain, as whispers or echoes of their ancient selves. One race that definitely survived, of course, was Men. The Third Age of the World was also the establishment of the Dominion of Men, and that's the ultimate bridge between Tolkien's world and our own. Middle-earth is conventionally treated as a single continent, but in fact may have consisted of more than one landmass. Tolkien's writings on this topic, and especially his Letters, suggest that Middle-earth is defined as that part of the world inhabited by mortal beings (that is, all the lands of Arda except Aman and, apparently, the Empty Lands). It might therefore easily have consisted of more than one continent. The Silmarillion specifically states that Aulë was individually responsible for making Middle-earth: he "wrought two mighty lamps for the lighting of the Middle-earth which he had built amid the encircling seas". (The Silmarillion, 1 Of the Beginning of Days). This interpretation is supported by Tolkien in his letters, and also by the quote above (note 2). In fact, the name is from an Old English word: Middangeard (probably more familiar in the form Midgard - see The Letters of J.R.R. Tolkien, No. 165). We are given no clue as to where this hall might have been. It's tempting to imagine a connection with Khazad-dûm, and this would certainly help to explain the 'sign' that Durin saw in the lake of Kheled-zâram, but Tolkien doesn't hint at any such connection. Original content © copyright Mark Fisher 1997-2000, 2006, 2008. All rights reserved. For conditions of reuse, see the Site FAQ.